That's definitely true of precious metals in the past 30 days. But, the real story is far bigger than just one month. In fact, gold and silver have seen declines of more than 30% and 50%, respectively, since 2011. Now that's news! If you invest in precious metals, you owe it to yourself to read this brand-new report, Bob Prechter's Big 5 Gold Warnings for Bulls and Bears, from Elliott Wave International. 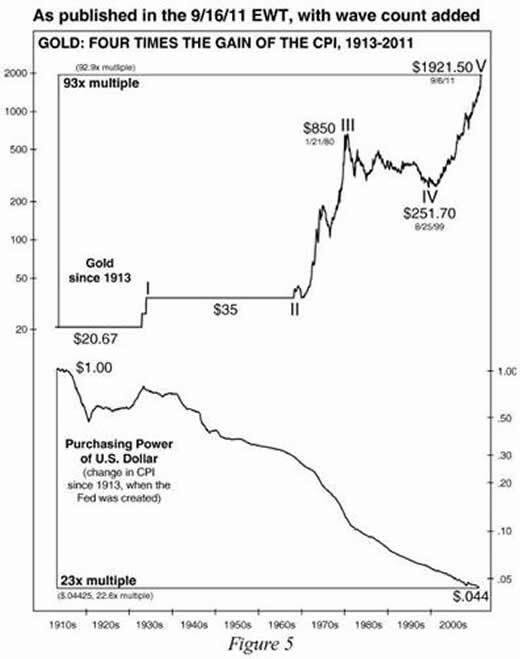 Those who argue that gold is still cheap might want to consider [Figure 5], which shows that since 1913, when the Fed was created, gold has achieved four times the gain of the Consumer Price Index. To match the gain in the CPI, gold would have to fall below $500/oz. Granted, the CPI is a manipulated index, so it might understate the true gain in consumer prices. But there is still a notable disparity. When the CPI starts falling, gold will have to drop even further to narrow this discrepancy. P.S. If you follow the link above, you'll see a stunning chart of some of EWI's gold and silver forecasts over the past three years. 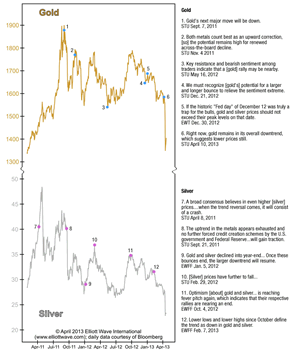 When a market's wave patterns are clear, as they are now in gold and silver, it is a remarkable sight. See the chart now.